Even if your new harp is working okay, manufacturing processes often miss some of the finer points, and parts can rattle loose during long sea voyages. Here, you will find three simple improvements you can make to a harmonica that will make it more responsive and more pleasant to hold and play. For a harmonica that is bolted together, the easiest thing you can do to make it play better is to take it apart and put it back together! By doing this, you can make the harmonica more airtight and improve the alignment of its parts. Harps that are nailed together are harder to take apart and reassemble and don’t benefit from this procedure, except in the hands of an expert. How does taking a harp apart and putting it back together help its performance? Well, when harmonicas are assembled in the factory, the bolts sometimes don’t get screwed in all the way. Later, as they travel in a cargo container on the high seas, vibration can loosen the bolts. When you have the harp apart, have a look at the reeds, the reedplates, and the comb to get familiar with the insides of the harp. Harmonicas often come from the factory with reeds set high above the reedplate. High reed action can help you when you first start playing harp because a reed set high functions even when you breathe too hard or use too much suction or mouth pressure. But as you gain finesse, you’ll find that the reeds are more responsive and require less air if you can lower them a bit. So when you’re ready, one simple improvement you can make is to gently flex each reed downward through its slot. To make this performance adjustment, poke the reed through the slot with a toothpick and then slowly and gently flex it and let it go. Don’t yank or pull hard on the reed — you don’t want to break or crease it. When you’re done, the reed should sit a little closer to the reedplate. Make sure to plink the reed to let it settle before judging the result of your work. The reed shouldn’t end up pointing down into the slot, and it should have a small gap at the tip about the same as the thickness of the reed tip. If you lower the reed too far, flex it upward until it doesn’t dip into the slot and has a gap at the tip. Some harps have sharp corners and edges. You can smooth and round these spots with sandpaper or a file so they don’t cut into your hands and lips. You need a hard, flat surface. A piece of plate glass is ideal, but a countertop will work. To break edges and corners, use 180-grit or 240-grit sandpaper. For finishing, a finer grit somewhere between 320 and 600 will do. If the edges of the harmonica’s reedplates are exposed, you can drag the edges and corners against the sandpaper. 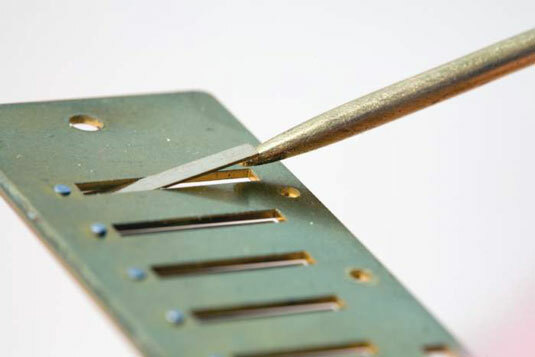 If the front edges of the reedplates are exposed to your lips, remove the covers from the harmonica and then either break the edges of the reedplates by running a file along the edge or sand the edge, being careful not to sand the “teeth” of the comb itself. On some harps, the rear edges of the covers may have sharp points or edges that can poke or cut your hands. Use a file to dull them.